Saucedo Scholastic Academy Teacher Josefina Rivera is participating in an educational challenge to win her school $5,000. 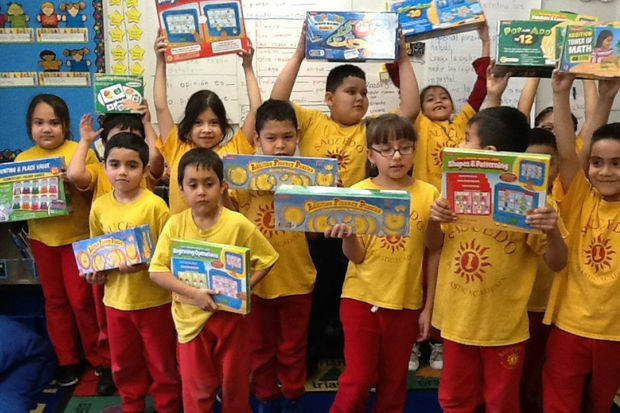 LITTLE VILLAGE — Math and science aren't just for study inside the classroom, notes first-grade bilingual teacher Josefina Rivera. To help her students at Maria Saucedo Scholastic Academy understand that, she's entered them in the Science Everywhere Innovation Challenge, a competition to encourage students to use math and science skills even when they aren't in school. Five teachers with the best projects will get $5,000, and the winners will be announced in September. Rivera set up a page on DonorsChoose.org to raise $463, which was matched by the Overdeck Family Foundation and the Simons Foundation. The project involves her first-grade students at the academy at 2850 W. 24th Blvd. using sky observation kits. The kits allow the students — many from Spanish-speaking, high-poverty homes, she said — to explore the sky and space at home. This helps parents participate in their children’s education and prompts the students to apply scientific concepts in real life, said Rivera. New science standards have recently been implemented so students are learning more about physical and life science, in addition to earth and space science, Rivera said. Through the New Generation Sky Watchers kit, students will be able to observe objects day and night. The idea is to learn more about concepts such as rotation and revolution and temperatures in the sun versus the shade. Students will teach classmates about the topics they have studied at home and will be assessed before and after the project to measure what they've learned. Twelve Science Everywhere judges will pick the winners based on how well the projects cover math and science and promote learning outside the classroom. Judges include former astronaut Leland Melvin and NFL player Victor Cruz, whose foundation is focused on getting kids into science, technology, engineering and math careers. "My parents were educators who inspired me and so many others to reach for the stars," Melvin said in a prepared statement. Three-quarters of Nobel Prize winners in the sciences say their interest in the field was sparked by an experience outside of school, Science Everywhere officials say. The school could use the $5,000 prize, Rivera said. “We don't have technology in the classroom,” she said. “We have an old computer, so this will help a lot. I’m keeping my fingers crossed,” she said.